The time of the year can really make a big difference in the flow of water in the rivers. 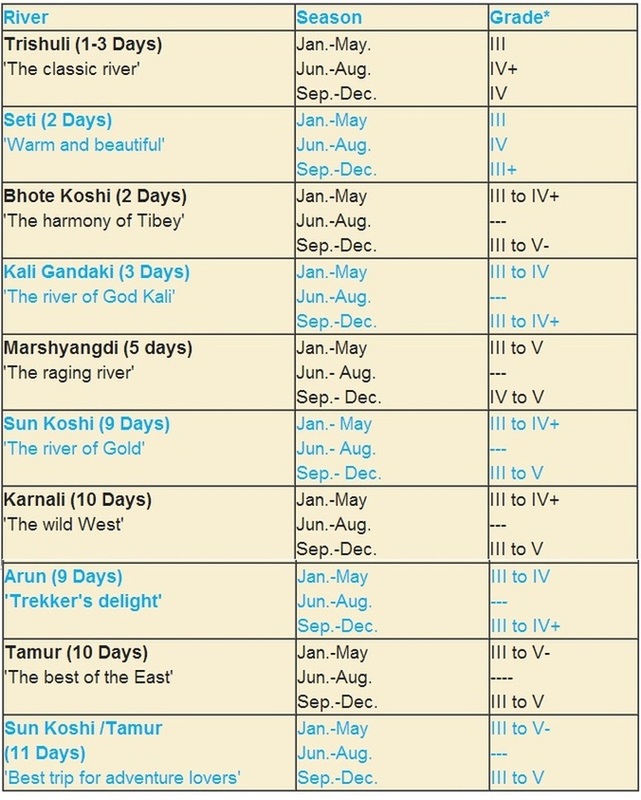 The flow of the rivers during the monsoon in July and August are ten times are more than the flow of water in March. It is usually best for beginners to go on a trip after mid-October, when the rivers become milder. During the November the rivers are mainly fast-moving, but not too difficult. The busiest rafting season is in October and November. The best seasons for rafting are from September to December and March to early June. In December and January many river become cold and unless you have a wetsuit they may not be enjoyable. The winter is not as cold as might be expected because most of the trips are on rivers areas below 500m elevation. The rivers are the most mild between from December to April. During the winter is a slower time for tourism, there are less options with tour operator for rafting trips. From March to the mid-May because the river flow is low, the rivers do not move as quickly. If the water is running faster on a river at a particular time of the year, the trip can take a shorter time than if it is running slower. From early September to early October and late-May to late-June (when snow melts in the mountains and some pre-monsoon rainfall) the rivers can flow very quickly. During this time rafting can be more dangerous than normal. 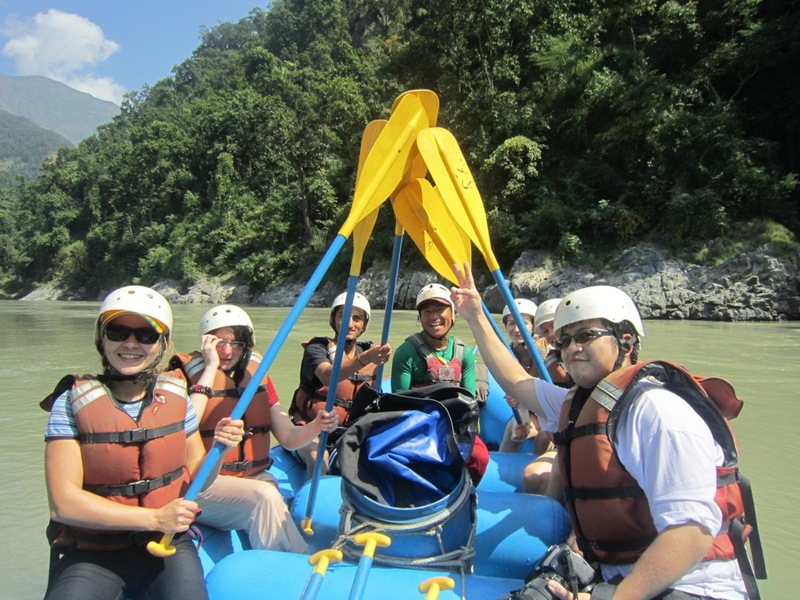 It is best to raft with an experience company at this time, because extra precautions need to be taken. During the monsoon, from June to August only experts should do rafting trips. During this time there may be 10 times as much water flowing in the rivers. Rafting can only be done on certain rivers during this time. Various rivers can be different depending on the time of year. Depending on the time of the year you are in Nepal, can adjust what river you go on. The following lists are suggestions. The actual equipment that you carry will depend on your likes and dislikes. The lists include most of the items that might be carried on a luxurious-style raft trip where weight isn't much of a problem. If you are going on a lightweight raft trip or on a self-supported kayak trip, then pare down and choose those items which will meet your needs yet still enable you to be safe and self sufficient. Feel free to make printed copies of the list and check off items as you are getting ready for the trip. Minimum of patching material and adhesive appropriate for type of boat and material it is made of. Will have such things as a spare valve, heavy - duty thread and needle for sewing tears, spare parts for raft and frame, duct tape, wire, oar lock parts, etc. appropriate for the type of valve. One per boat. Usable platforms to keep gear off the floors. We shall use cargo nets to secure cargo to raft. All gear must be securely attached to raft to prevent potential loss. A three~five gallon buckets for non-self-bailing rafts – 2 each. Plenty of cargo straps for attaching gear and accessories securely to rafts. 100’ Bowline will be taken for tying up boats to shore. A handline rope/webbing will be secured around the perimeter of the raft for self - rescue or to hold onto in rough waters. We shall carry a 150' non - stretch rescue rope and Rescue throwlines in bags will be in each boat and everyone should practice using them. Multi-day trips will require the ability to transport food, cooking gear, ice chests, and stoves and fuel etc. We shall take a firepan for open fires, shovel, First Aid Supplies, Water carriers, garbage bags & other supplies to maintain a clean camp. All trash & garbage will be carried out. Have one change of clothes packed dry for when you get wet. Use synthetics or synthetic / cotton blends for coolness, lightweight and rapid drying inside plastic bags. • Nylon/neoprene or leather gloves for warmth, protection or better grip. Use synthetics or wool for rapid drying and warmth. Have a complete change of clothes packed dry – preferably inside plastic bags. • River sandals or shoes designed to get wet or aqua socks or wetsuit booties for river use. Athletic shoes or light weight hiking/walking boots for on shore. • Small personal size First Aid kit Personal medicines if and as required. • Type 30 and lower numbers if desired, waterproof. • Camera & Film - Packed in special waterproof camera box or water tight amino can. • Binoculars - Same as for camera. • Guide Books - River guides, flora, fauna, geology, etc. • Fishing Gear – Optional!! • Watch – Inexpensive Water Proof! • Sleeping Bag - Synthetics best (dries faster and insulates when wet). • Shelter - Free standing tent (on sandy beaches it can be hard to get tent stakes to hold), Tarp or other shelter from rain and wind and bugs. • Storage - Heavy-duty PVC waterproof bags to store and transport gears – we also provide dry barrels that will be tied to the boat. Nepal’s rivers can be broadly divided into three categories in accordance with their origins. The first category comprises the three main river systems of the country-the Koshi, Gandaki and Karnali river systems, all of them originating from glaciers and snow-fed lakes. The Koshi river system consists of the Tamor, Arun, Dudhkoshi, Likhu, Tamakoshi, Sunkoshi and Indravati rivers. Of these, the Arun and Sunkoshi originate in Tibet . The confluence of these rivers is at Tribeni (near Dharan) in Sagarmatha Zone. Flowing for almost 10kms through a narrow gorge before entering the plains, the "Sapta Kosi" or he "Koshi" swollen with the waters of the seven riversÕ finally merges into the Ganges . The Gandaki river system in central Nepal consists of the Kaligandaki, Budhigandaki, Marsyanghi, Trishuli, Seti, Madi and Daraundi rivers. The Kaligandaki is the longest river and the Trishuli, the main tributary of this system. The Kaligandaki originates in Mustang and converges with the Trishuli at Deoghat in Chitwan. The river is then called the Narayani and goes on to meet the Ganges . The Karnali river system in western Nepal consists of the Humla Karnali, Mugu Karnali, Seti and Bheri rivers and is the longest river system in the country. The Humla Karnali, which rises in Tibet , is the main tributary. After entering India , this river assumes the name Gogra . Rivers like the Mechi, Mahakali, Bagmati, Kamala, Rapti, etc., most of which have their origin in the Mahabharat range, constitute the rivers of the second category. The Bagmati, which rises at Bagdwar and drains out through the Chobhar gorge, is the principal river of the Katmandu Valley .